There were times when Craig Ronaldson wondered if the sacrifices were worth it but for all of the recent graduates from the All-Ireland League (AIL), few have enjoyed as much success as the Connacht playmaker. The 26-year-old was outstanding in Lansdowne's first top-flight AIL success in 2013 and, after finishing as the league's top points scorer (206), he was duly named player of the year. It capped what was a brilliant season for Ronaldson but his is a journey that really began in February 2007. Hailing from Naas, Ronaldson attended Kilkenny College as a boarder and in his fifth year in the school, his Senior Cup team wrote themselves into the history books. It is a result that still stands as the biggest shock in Leinster schools rugby, although Roscrea might have something to say about that after they also toppled the mighty Blackrock two years ago. Few gave Kilkenny a chance as the rank outsiders arrived in Donnybrook for their quarter-final replay against the hot favourites Blackrock but what unfolded was unforgettable. Ronaldson set his side on their way to a famous victory with a try that he converted and when a certain Ian Madigan missed a penalty from in front of the posts in the 13th minute of injury-time, Kilkenny had their day. From that day on, Ronaldson caught the rugby bug but his push for a place in the Leinster Academy didn't quite pan out the way he was hoping, as he recalls. "I was definitely disappointed. It was a frustrating period of time. It's that time when you start to wonder where you're going. Especially when you see all your college mates going out pretty much every night. You're wondering, 'Aw, should I be linking up with them?'" "It was just seeing guys moving on who I would have played with and against. When I played senior for Lansdowne in the AIL, you were coming up against guys who were in the Leinster Academy. You had senior guys playing every now and then as well. "It was a real eye-opener, and good experience, knowing that you could match it with these guys and that you were capable of putting one up on them as well." The disappointment remained with him but rather than letting it end his dream, he used it as motivation. Playing in an exciting Lansdowne team under Mike Ruddock, Ronaldson was the man entrusted with pulling the strings. His reputation had steadily been growing on the domestic scene before the success in 2013 really put his name out there and it wasn't long before the offers started to arrive. "Always at the back of my mind, rugby was something that I wanted to pursue. I just thought that if I could play for Lansdowne, I'd never know what might happen," he says. "There were times when I was even looking at going over to the Championship in England but I decided against it and stayed in Lansdowne for an extra season and that's when we had that good team there and we won the league. 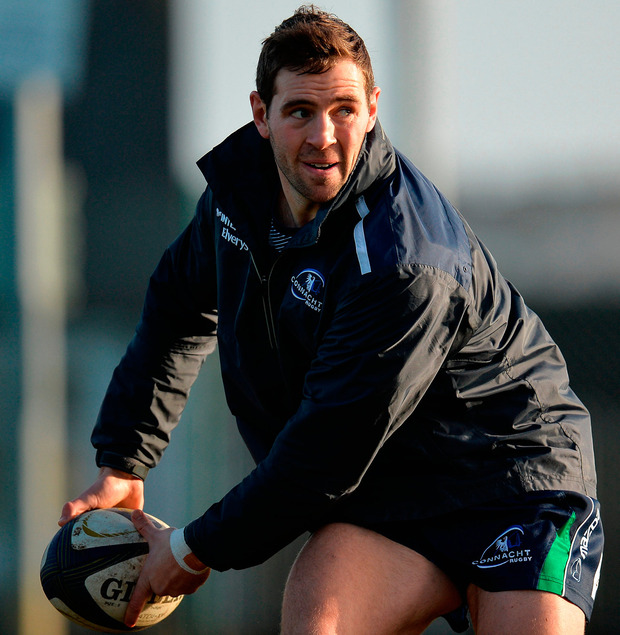 "I got a bit (of interest) off the back of that and thankfully Connacht came calling. I was happy with how it worked out in the end. It probably wasn't the straightforward route but I think it's actually held me in good stead going forward." Switching between out-half and inside centre in Ronaldson's first couple of years with Connacht afforded him plenty of game-time but his main aim was to nail down a regular starting spot in either position. Robbie Henshaw's departure last summer opened up a slot and rather than look elsewhere for a replacement, Pat Lam put his faith in Ronaldson alongside the explosive Bundee Aki. It's a midfield partnership that has flourished and is one that doesn't always get the credit it deserves. Injuries have hampered Ronaldson's progress this season and just as he returned to fitness, Aki faced a spell of his own on the sidelines. Those Saturday afternoons playing in the AIL now seem like a distant memory for Ronaldson who was rewarded for his form with a new two-year contract extension last year, but he has never forgotten his roots. "It would have been hard to believe back then, I suppose yeah," he smiles when asked if he would have believed four years ago that come tomorrow afternoon in Toulouse, he would be 80 minutes away from playing in a Champions Cup quarter-final. "But now, it's fully believable. Even from my time since I've come to Connacht, how the mindset and how the culture has changed around our club. My first season here, the mindset was that we weren't expected to win consistently. "Personally, having grown up supporting rugby and watching the Heineken Cup knockout games back in the day, they were amazing. They were the games I loved watching. "To get to one of them would be great. It would be massive. Just to back it up for the club and for the province as a whole would be massive for us. "I don't think many people would have thought Connacht could be in a quarter-final of a Champions Cup a few years ago. Hopefully we can go and do it now and keep the buzz around the city." Ronaldson may not have taken the conventional route to professional rugby, but it is one that again proves the value of the domestic game in Ireland.